A treehouse to children is a place to call their own. The vision is of five bikes leaning against a tree with five little boys huddled in their tree house telling secrets and designing a most important sign that reads, ‘no girls allowed’. …Or you might find the same scenario with five little girls instead. 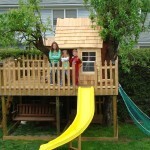 There’s nothing like a hideaway for children, and a treehouse can be exciting and entertaining as well as adventurous. However, there should always be rules and precautions put into force in order to keep the children safe in such a high environment. 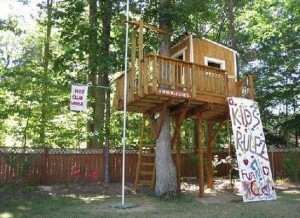 Do you need a building permit to build a treehouse for your child? Some neighborhoods do have municipal regulations. However, it depends on the nature of the house you’ll be building. Are your neighbors going to have it in their vision when they look out the window? Will it infringe on anyone’s privacy. More often than not, a neighborhood regulatory group wouldn’t become involved unless a neighbor makes a complaint. We would certainly be kidding ourselves if we thought that treehouses do not do damage to trees. 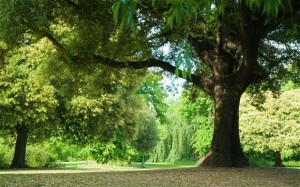 Just stomping by foot at the base of the tree tightens the soil, which can be harmful to the roots. So, to minimize this damage, support the tree by putting fasteners, but not too close as it can cause weakness to that part of the tree. If you can’t be assured of your child’s safety on the street, in the backyard or in a playground, how then can you guarantee his or her safety ten feet off the ground? And that is the standard…ten feet. However, at the bottom or the base of your tree, it would be advisable to add a good foot of mulch. Sand, gravel or even wood chips can still harm your child in the event they fall, so mulch is the best form of cushioning. Remember, kids are daring and it doesn’t take much for them to jump down rather than take the ladder you for them. Thick, thick, thick. At least a foot thick. Try to keep in mind that twelve inches spell s-a-f-e-t-y, keeping in mind that you’re not the one picking the tree for your house, the tree is out there picking you. Just like people, each and every tree is different so let them guide you. Allow for its growth and consider sunlight. When you find that tree, the first thing you want to look for is rotting wood, peeling wood and signs of distress. It might be wise to call in a tree specialist before you make the choice yourself on which branch or two you believe is suitable for building a treehouse. Walls. First of all, the kids will be using this as a personal hideaway. Why in the world would they want everyone to see them tell their secrets through guard rails? Additionally, walls are safer. Never allow a child under six years old to go into the treehouse alone. Build a real ladder onto the tree to the treehouse rather than a rope ladder. In fact, in order to avoid accidents of strangulation, it is best to keep all ropes and trains away from the treehouse. It is generally not recommended to allow kids to sleep overnight in a tree house. Instead, do a family backyard campout with a tent and all. Get some good sleeping bags for the kids and even some sleeping sacks (link) for the younger crowd. A wearable blanket for toddlers allows new walkers the freedom to walk around with them. Bottom line, it’s all about the children. What you are considering to build for them should afford them adventure, happiness and safety. Look into permits, keep it at a safe height, stay away from ropes and chains and surround the children with walls to keep their secrets safe. If you have decided on taking a power supply to an outdoor shed, you might need to decide whether to run it overhead or take it underground. Running overhead is quite a simple approach but exposes you to risks of accidental damage. The underground method is a bit complicated but it is a safer approach. The process involved in running a cable overhead includes using ordinary PVC sheathed cables and the spans need to be less than 10 feet. If it is longer than this, you will need additional support by wire and cable buckles. Underground-run cables are usually protected by PVC conduit. The cables are buried 18 inches below the ground and are attached together by straight connectors. 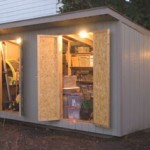 It is important to have a dedicated outdoor socket for your shed so that you can avoid trailing long extension cords, which pass through open windows. It is also a safe method as it provides protection if you are handling electrical equipment outside. This will require a waterproof outlet with a ground wire and an indoor socket. Alternatively, you may choose to connect a separate GFCI indoor after installing an ordinary outdoor outlet. I had a unique issue when running wiring to my shed. Because the shed is at the bottom of a sloped hill, cell phone reception is an issue because the shed also works as my workshop which I can spend hours in at one time. To remedy this, I installed a cell phone signal booster which is connected to an antenna at the back of the shed. I went from getting no reception on my phone to 3 or 4 bars. Something to keep in mind for those who have poor reception in their shed and spend a lot of time there. You can get more information about mobile phone signal boosters online. Dig a deep trench of about 2 feet from the panel extending to the front of the shed. Roll the gauge wire into the trench. Completely bury the wire ensuring the soil is level for a neat finishing. Run the excess wire from the rolled gauge wire by knocking out the slot located at the bottom of the panel, and then slipping the wire at the front of the conduit. This will leave room for the excess wire to hang free. Bury any exposed wire. Ensure the power is still off as you cut and divide the wire into appropriate lengths. The black wire known as hot wire should screw well into the breaker. The neutral wire commonly referred to as the whit wire is screwed into the neutral bar. The bare wire should be able to screw into the ground. Use a 1 inch spade, drill through the shed siding. Attach a PVC piece conduit of about 2 feet to another LB fitting. Ensure you run the wire through a fitting. 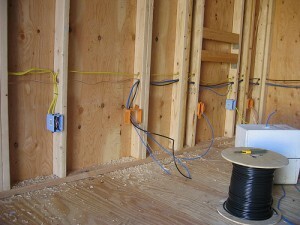 Follow the manufacture directions in wiring the GFCI after the wire is inside the outdoor shed. In order to ensure the GFCI is protected for all the outlets, ensure the load terminals are connected to the wires. In order to supply power, the final outlet and the switch must have a loop in between. The light fixture is located from this switch. 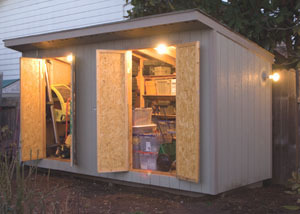 Installing electricity to your outdoor shed is a project worth carrying out for your own convenience and safety. The wiring work may require a complicated process but it adds protection for outdoor use of electrical appliances. So you’ve decided on a swimming pool and pump. Don’t forget to budget in a good pool ladder. 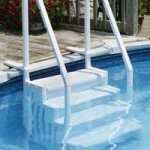 Pool ladders help you to get into and out of pools safely and easily. Be it in-ground pool or above-ground pool, badly designed wobbly pool ladders are prone to cause accidents and can make you lose your peace of mind easily. A pool ladder might look like a simple attachment but there are lots of important factors that distinguish good ladders from poorly designed ones. The Adirondack chair is considered to be one of the most comfortable outdoor chairs available, but you can make it even more comfortable by adding chair pads. 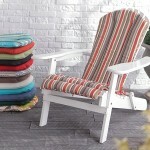 This type of chair was first designed by Thomas Lee in 1903 because he could not find an outdoor chair that he liked. The chair is well-known for its large armrests, wide seat and sloping backrest and is made entirely from wood, including the wood slate seat and backrest. Many people agree that these chairs are extremely comfortable, but purchasing the right chair pads can add extra cushioning. 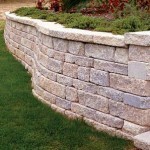 Retaining walls can be very helpful and there are a lot of retaining wall ideas if ever you want to build one. When creating a wall, you must have a purpose for it. In the past, walls were created to protect a nation from its enemies. Today, walls are used to provide support to buildings and infrastructures. In cases of volatile slopes in landscapes, a retaining wall can be highly efficient to help control the soil and prevent any erosion. However, in order for a retaining wall to withstand the pressure that the sloping landscape is producing, the wall must be very sturdy and the retaining wall construction has to be done properly. Copyright 2014 WTLandscape.com. All rights reserved.